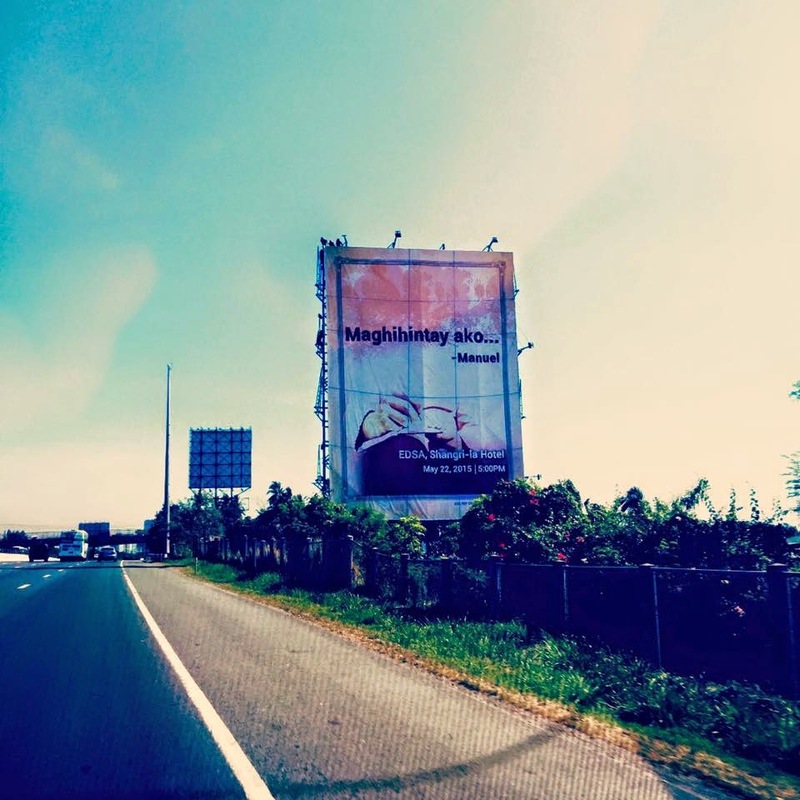 I live in the South of Metro Manila and I can't help but notice this billboard hoisted along the South Superhighway when I was homebound from Muntinlupa a day ago. “Maghihintay Ako, -- Manuel” is simply eye-catching! It gave me something to think about. Who is Manuel? Is he another love-stricken person who professes his undying love for the woman he is smitten with? Love is not just words, but also action. And professing one's love without shame or pride and sharing it with the world would truly make Manuel's girl happy. As a firm believer in true love, I can’t help but envy his girl. I love it when a man asserts his love for a woman. Though perplexed at the story behind the billboard, I forgot about it until I saw another similar billboard going up North near Valenzuela. Manuel's attestation now got my full attention this time. Why is he waiting? Who is he waiting for? This second billboard distracted me and my daughter at mid-conversation that I gave it a longer look hoping not to miss the critical clue in the mystery billboard we were looking at on the road. The billboard sign indicates the date May 22, 2015 and EDSA Shangri-La Hotel. What would happen at EDSA Shangri-La Hotel on the day stated? Is this a wedding proposal? Who is this mysterious character Manuel is waiting for? Does this statement stir you emotionally as well? What comes first to your mind after reading it? This seems like another event that remains puzzlingly unsettled until the very end. Share your thoughts. I'd like to read it. It stirs curiosity in people, right? A pledge of love perhaps? Manuel, Sino ka nga ba? #Intriga din ako sis... Maybe a love story that will start on May 22. Catchy marketing strategy they got there.Thumbs Up! Is it a Marketing Strategy? Intriguing! I wonder what this billboard's message is all about. Looking forward to the day the mystery is unveiled. The advertising company has a lot to explain to you and I think,millions of curious people about this billboard. That's the wayofenticing your hidden feeling towards the picture, place and name. Great ads indeed! Since I do not pass by that area, it's my first time to see it. And yes, I agree that it's attention-grabbing! Hmmm I think though that it's not a man waiting for a lover or anything similar. Since I'm more of a food blogger, I'm thinking that Manuel is the name of a new restaurant inside the hotel. Yes, it could be about a new foodie joint. Is that the home coming of Manny Pacquiao???? Hahahaha...his real name is Manuel and I just found out that he and his family are going to stay at the Shangri-la Hotel. Hmmmm....just guessing. But if I am wrong, well what a nice marketing idea from the people of Shangri-la. Ha ha Pacquiao never entered my mind but you could be right. wow! na-curios naman ako. Lucky is that girl naman. This reminds me of Olivia Will You Marry Me billboard in Edsa. I wonder what this one is all about. I can't wait for the next "episode". That billboard is really intriguing! I can't wait to find out what's going to happen on May 22 as well. The message is intriguing though it's difficult to speculate what's that all about, and perhaps what's better way to do is let's just wait for the date to come and soon it will be revealed. #MaghihintayAkoManuel is really making me curious... love story unraveling? or a marketing ploy? It's weird but the first thing that comes into my mind when I read this is that, he could be writing to a guy.. haha.. but it's just me. Obviously it's a marketing ploy. You would not spend money for a billboard without any catch. It's my first time to see this billboard here. It looks interesting. I agree that it is intriguing! If this is for a company, they've succeeded in grabbing our attention already. Sino nga kaya? Haha Very effective billboard ad. I used to be in marketing so I think this is an ad campaign. Ang yaman naman if this is only a personal gimmick.. lol! Ad campaigns that appeal to the emotions are known to be effective. Good job to the people behind this because it got everyone curious, even me. I asked my son and daughter opinions about the said billboard. And theor reaction... Papz, pati pala ikaw na intriga rin. Mag-antay na lang tayo sa sagot ni "secret girl" coming soon na raw. I am as curious as all of you..we'll find out in a few. As for me it's some kind of hotel's advertising that caught your attention. But for me, it's nothing just marketing. You are right. It's a marketing campaign. I've been searching if this has been revealed already since it's May 24. I've been trying to search it in the net. Hmmm.. So, you went to Shangrila to find out who Manuel is? Manuel is Manuel L. Quezon University (MLQU). The mystery billboard was part of MLQU's campaign to emphasize the academe's historical significance to the new generation. Oh, it is already revealed. This is a smart campaign strategy. It gives the audience curiosity. I wonder who's behind this marketing strategy what for sure people are curious too to know who is that Manuel.